Thanks to X-Factor, we've got 3 versions of the same song in the top 40 singles chart this week. I think this has got to be the first time in history. This year's X-Factor was won by a girl named Alexandra Burke who I think sounds a bit like Leona Lewis. Anyway, the song she released as the "winner's song" is a cover of Leonard Cohen's "Hallelujah", and as can be expected when X-Factor is involved, it charted at #1 this week and is officially the Christmas Number 1 for 2008. Now thanks to the beauty of the internet, and the fact the chart now takes into account downloads, the people's preference is really taken into account. 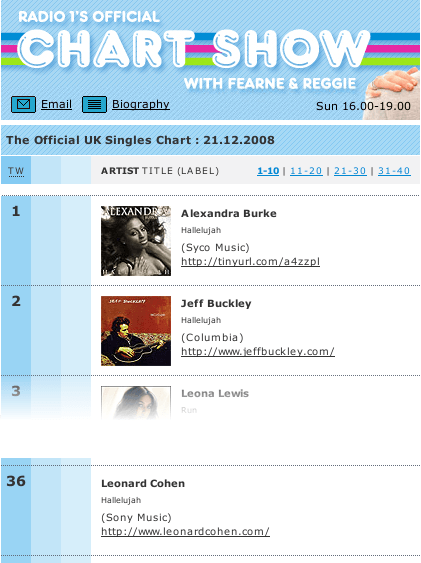 Thanks to X-Factor, Jeff Buckley's estate/family are in for a huge wadge of royalties thanks to it charting 2nd (Jeff Buckley's version) and Leonard Cohen can treat himself to a cigar or two as his version charted at number 36 this week. Sadly, the version most listeners of the chart show would have heard - Rufus Wainwright's cover as used in Shrek, didn't make an appearance.